There is a six-stream agenda covering Database, Apex & Development, Platform & Services, Coud Apps, EBS Apps tech, and Business Analytics/systems & EPM, so pretty much the whole breadth of Oracle Tech, Apps and BI. We have a keynote by Oracle’s Caroline Apsey on the Bloodhound Project, the UK-based group trying to smash the world land-speed record with a 1,000mph rocket car – and solve lots of engineering challenges on the way. And uses the Oracle Cloud. I’ll be sure to see that one. 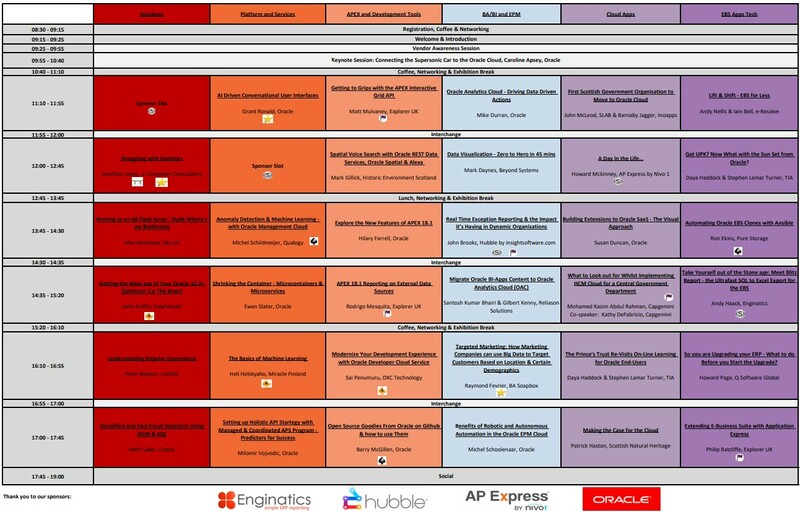 With 6 all-day streams there are a lot of presentations to choose from, but as a taste of what is on offer I’ll mention Jonathan Lewis talking about stats, Heli Helskyaho explaining the basics of machine learning, and from Oracle we have Grant Ronald on AI-driven chatbots, Hilary Farrell on the new features of APEX 18.1, and Keith Laker on JSON & SQL. The talks are a nice mixture of end-user experiences, recognised experts and Oracle themselves. UKOUG is independent of Oracle so although we are very happy to have Oracle support us, we have talks that are not just what Oracle are currently pushing. This is what I love about user group meetings, you get the whole story.